For the second year in a row, I am participating in the Adoption Interview Project, brainchild of Heather at Production Not Reproduction. This year over 120 adoption bloggers (not necessarily Open Adoption–but bloggers who write about adoption in some way–members from every part of the triad) are participating all over the ether! To learn more about the project go here. I am pleased to introduce my readers to the partner I was matched with-Laura Denver of Fertility Alphabet Soup. Right off I appreciated Laura’s frankness, clarity, and ability to morph her message and blog from that of a fertility context to one engaged in issues relating to foster care and adoption. As someone who holds the possibility of a fost-adopt of an older sibling in the wings for years down the road–I am pleased to have connected with Laura as a resource. You can also find our interview over on her blog when you stop on by! What is the best piece of wisdom someone who has been involved in foster care has shared with you along the way and why? “Anything can happen.” Nobody involved in fostercare is a soothsayer. We’ve seen kids go back to parents still on drugs. We’ve seen them split up half-siblings that have an established relationship to be with a full-sibling that was just born “to keep siblings together.” Even when we’ve been told that there is “no way” the parents are getting their kid back and things are moving toward TPR (termination of parental rights), the parent works their plan very diligently and is able to be reunified with their child. Anything goes. 2. Who are you hoping to reach with your writing? Or have you had any surprises in terms of readership, or comments that really fuels you to keep writing? I started the blog for myself. I used to keep a journal but moved online because it was easier to keep it all in one place. My readers have morphed since I started. In the beginning, I had a few readers I knew from infertility support groups. Now I have more from the foster and adoption side. It makes sense that as my journey has changed so has my readership. I don’t advertise, I am blocked from the search engine so when somebody outside of my known circle sends me a comment, it’s a little exciting. 3. How has parenting through foster care motivated you to shift your own beliefs or thinking about child rearing, or parenting in general? Can you share a particular event or story that gave you that ah-ha? The ah-ha moment came to me not because of parenting, but more from understanding why kids end up in the foster system. As a parent, I have support from my parents, my neighbors, my co-workers. I have the luxury to be able to reach out online to gather advice or skills I need to parent. A lot of the families in the foster system do not have that support. There is so much dysfunction (drugs, abuse, mental health) that they are not able to create healthy relationships. They don’t have the support network that can catch them when they fall. The kids get caught up in the middle. It’s made me feel very fortunate to know that if something happens, I will have someone to be there for me. 4. What is one question you have always felt you wished people would ask you when they are curious about your family? I love the looks I get when I go through the grocery line with WIC checks on one bill, then expensive balsamic vinegar and organic foods on the other. It took me swallowing my pride to get WIC (all foster kids get WIC), but I don’t qualify for the child deduction from the IRS it helps a little with the bills. We’ve had kids living with us for over a year, just not 1 for more than 180 days at a time. 5. Do you have a real time or online mentor/ support group that you go to when you need help? How did they come into your life? If not what kind of support do you wish you had? I have several blogs that I follow and can reach out if I need a different perspective. Right now I’m trying to find support to help with creating an open relationship after foster care with the birth family. 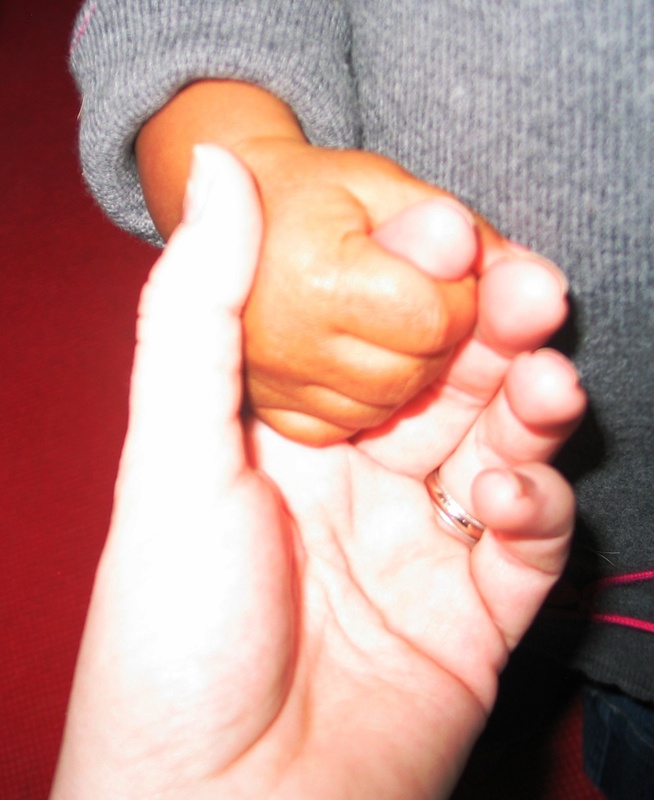 With all of our foster kids, we’ve established a relationship with the birth family. This was an unusual case where the original foster family had a relationship but we did not. The birth family is out of state, which makes things even harder. Right now we’re just taking it slowly. 6. You and your husband were not initially planning to pursue adoption, and now find yourselves months away from it. Can you talk a little about that journey? We have always wanted kids. We thought that down the road we’d foster after we had our own family. We also thought that it would be easy to have kids. We went down the path of assisted reproductive technology but stopped after “only” 2 IUI. Adoption wasn’t our first choice but it wasn’t our last. We still have the option to try injections and then IVF. But we decided we didn’t care if we were biologically related to our child, our goal was just to be a parent. I think we were a little naive about all of the appointments, paperwork, visits, drama that we’d have to go through to bring a foster child in our home. I love my daughter and yet I felt I was always going to be a mom of two. We’re still undecided as to what happens next. 7. How has your role as parents brought you closer together? How has it made your relationship stronger? We totally support each other. I put one of the kids in time out and my husband happened to walk in the door. The kid started protesting but my husband said, “I don’t know what you did, but whatever it was – was bad enough for LaLa to put you there to think about it.” He didn’t even question my reasoning. 8. If you could teach a class to perspective parents–what are three topics you would INSIST be part of the course? I am loving these interviews, the questions and the responses. So much food for thought. On Q 3. “There is so much dysfunction (drugs, abuse, mental health) that they are not able to create healthy relationships. They don’t have the support network that can catch them when they fall. ” Yes, yes, yes. It really makes me angry to hear the “if so and so would just pull themselves by their bootstraps they could make it in the US, anyone can make it. We don’t need a social safety net.” argument. Grrrr. You can’t pull yourself up by your bootstraps if you have no boots. A little off topic, but it is what I thought of. Thank you Laura and Mama C.
Well said! Thanks for leaving the feedback too. Having watched you and your husband with my kids, Denver-Laura, I am not surprised at all that you are such good parents to the children who have come into your home. I like the topics you list and would pay you to come teach me do those things better!